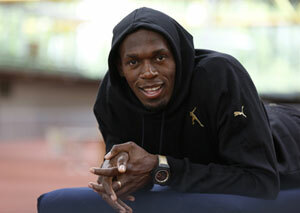 Swiss watch brand Hublot has introduced a new model of King Power Usain Bolt Ref. 703.CI.1129.NR.USB12, dedicated to the world’s fastest man – Usain Bolt. In addition to the many specific characteristics that are modified by the novelty, was a unique strap watch: it is made of exactly the same skin, from which it was made shoes for a sprinter when he was in 2008 in Beijing, set a world record. New released in limited edition of 250 numbered copies. Model King Power Usain Bolt Ref. 703.CI.1129.NR.USB12 sporting body has a diameter of 48 mm, made of black ceramic. Sapphire crystal with inner and outer anti-reflective coating is fixed to the body of a black ceramic bezel, which recorded six H-shaped titanium screws with a black PVD-coated. Sapphire glass on the periphery of the gray marked out-minute track. Inserts made of black rubber on the sides of the body emphasize its sporty image. At the 3:00 position is set crown made of titanium with a black PVD-coated and rubber inserts. On the back of the Ceramics sapphire set with a stylized picture of Usain Bolt. The case is waterproof to 100 meters. On the flange matt black dial set with minute markings 2N gold-plated. Time is indexed by the central arrow in polished black nickel, black-coated fluorescent substance SuperLuminova ™. Time indices are also made of nickel black and luminesce in the absence of light. On a side display small seconds hand at 9 o’clock position is the silhouette of Usain Bolt, and Hublot logo at 12 o’clock position is made of 2N gold powder. The timing functions are displayed on a 30-minute display at 3 o’clock position, 12-hour indicator at 6 o’clock position, and through the central seconds hand. Date is set in a square aperture in the position of 4.30. Model King Power Usain Bolt Ref. 703.CI.1129.NR.USB12 designed on the basis of the manufacturing machinery and HUB4100 Automatic chronograph function. Collected at 27 stones, is the caliber of 252 components and provides 42-hour power reserve. Undoubtedly, the new chronograph in a traditional company Hublot style – sporty image, the silhouette of a clear, straight lines. 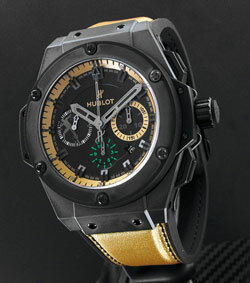 You can buy watches from authorized representatives of the company Hublot.